There has always been a creative tradition which passes from one discipline to another, without ever settling for a particular theoretical context, but which never loses sight of certain artistic experiences which have made this kind of expressive transmigration their linguistic identity. Sculpture and architecture have, in particular, always kept up a dialogue, both because they are close relatives – space and time are intrinsically linked to these two disciplines, to a much greater extent than any other field of design – and because the cultural background of the artists in question very often involves both professional areas. It may be written in the book of fate, either expressly or hidden between the lines of memory and thought; but in this case it is on the contrary evident, from every point of view. Isabella Angelantoni Geiger, an architect who has studied with some of the best representatives of the Milanese tradition, namely (even if she belongs to a much later generation) the BBPR and the Belgiojoso family of architects, having become acquainted with Alberico Belgiojoso at university, has certainly never forgotten one of the fundamental lessons of Ernesto Nathan Rogers, one of the founding members of the architecture firm, about the profession of architect: ‘I have already said that our method consists of seeking to capture the deepest reality and to translate it into acts of poetry’. The works of Isabella Angelantoni Geiger, which are truly sculptures that seek to ‘capture the deepest reality’ representing the foundations of the disciplines of composition, eventually change, before the eyes of those observing them, into forms and constructions that, while declaring their expressive autonomy in a clear and authoritative manner, nevertheless bring us inside urban and architectural spaces, with masses and voids, where lightness coexists with stability. In the final analysis none of us can avoid to reveal our origins, especially if we depend – as in the case of this artist – on expressive languages that become public by virtue of being ‘sculptures meant to be on show’; to let thoughts sediment, dialogue with other disciplines, in this case a careful reading, almost in the manner of an etymologist, of Italo Calvino’s ‘Invisible Cities’ which is also evident from the quotation of some city names used as titles for the sculptures, the use of thin metal wire, cotton, paper, acrylic, threads that bind and block the vertical and horizontal volumes to form true structural junctions, everything under the attentive and highly professional supervision of the architect; because it is impossible to forget one’s origins. But as Rogers wrote, “the deepest reality”, when it comes into dialogue with a special artistic sensitivity, as in the case of the works of Isabella Angelantoni Geiger, turns into “acts of poetry”. And this becomes evident if we observe her sculptures in their “aesthetic and semantic” autonomy. It is sufficient to take close look at works like ‘City#43’, ‘Zenobia’, ‘Isaura’ or ‘Duomo’ to understand that, along with the ‘architectural’ dimension, an expressive and symbolic aspect emerges with clarity and authority, turning any association with construction into a composition that lays claim to a linguistic and disciplinary autonomy. The drawing or model becomes a’work’, redeeming its architectural roots, which it does not deny but sublimates: a kind of decontextualization which is described with such clarity and lucidity by Nelson Goodman in his ‘Languages of Art’: ‘Even where the object represented is something simpler and more stable than a person, duplication seldom coincides with realistic representation’. 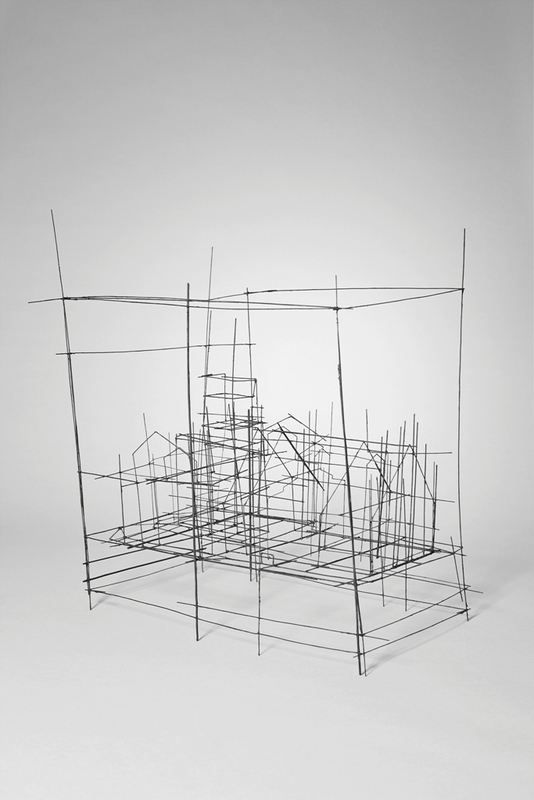 Isabella Angelantoni Geiger’s sculptures are not plans of cities, either vertical or horizontal; they have no analogy, except on a level of pure and simple oneiric similarity, with existing works, and they do not possess the distinctive traits that a project must have to be defined as such. They are much more; they are products of great inventiveness and of outstanding, precise, attentive and painstaking manual dexterity. There is, for instance, no welding; everything flows, almost as if there were an uninterrupted, infinite line; the structures are light yet stable and safe, even if they move the moment a whiffle or a breath approaches, as if they were living beings. Another peculiarity of these works consists of the fact that they may be placed on a flat surface, but it is also possible to hang them in space or arrange them along walls. In none of these cases do they lose their expressive identity, which is always recognizable: they dialogue with their surroundings while retaining a strong formal autonomy, maintaining a specific material quality which is a distinctive trait of the artist’s works. All artistic research is, naturally, based on past experiences; in this case the figure of Fausto Melotti and his extraordinary works, which remain without equals in the sculpture tradition of last century, loom in the background, even if the underlying reference is not the language of music in this case. Yet again it is architecture, a rarefied and essential architecture that comes to represent a kind of compositional musical staff. Again, every one of us, and clearly also the works of Isabella Angelantoni Geiger, belong to their background. Biographies are not mere stages in time of a life; every biography is a perimeter within which we move, more or less consciously. Isabella Angelantoni Geiger’s works are testimonials of the relationship between architecture and sculpture; they feature, with great coherence original constructive solutions that surpass everything they are inspired by. They are autonomous works, in the highest and most concrete meaning of the expression: they are sculptures. Esiste da sempre una tradizione compositiva che transita da una disciplina all’altra, senza approdare definitivamente in un particolare ambito teorico, tenendo comunque sempre fermo lo sguardo verso alcune esperienze artistiche che hanno fatto di questa sorta di trasmigrazione espressiva la propria identità linguistica. Scultura e architettura, in particolare, dialogano da sempre, sia per ragioni di affinità categoriale – lo spazio e il tempo sono intrinsecamente connesse a queste due discipline più di altre attività progettuali – sia perché spesse volte la stessa formazione culturale dell’artista coinvolge tutte e due gli ambiti professionali. E’ come se fosse un destino, esplicito ma anche nascosto nei meandri dei ricordi e del pensiero; nel nostro caso, invece, è evidente da tutti i punti di vista. Isabella Angelantoni Geiger, architetto che si è formato nella grande scuola di tradizione milanese dei Belgiojoso, ovvero (anche se la sua generazione è molto più recente) dei BBPR, attraverso le frequentazione universitaria di Alberico Belgiojoso, non ha certo dimenticato uno degli insegnamenti fondamentali di uno dei fondatori dello studio, Ernesto Nathan Rogers, a proposito del mestiere di architetto: ’ho già detto che il nostro metodo è nel cercare di cogliere la realtà più profonda e di tradurla negli atti poetici’. Ecco, le opere di Isabella Angelantoni Geiger, che sono e vere proprie sculture che cercano ‘di cogliere la realtà più profonda’ che sta a fondamento delle discipline compositive, si trasformano poi, di fronte agli occhi di chi le guarda, in forme e costruzioni che, pur dichiarando la propria autonomia espressiva in modo forte e autorevole, comunque ci riportano all’interno di spazi urbani, architettonici, di pieni e vuoti, di leggerezza e insieme di stabilità. In sostanza, ciascuno di noi non può fare a meno di dichiarare da dove viene, soprattutto se si affida, come nel caso della nostra artista, a linguaggi espressivi che diventano pubblici, in quanto ‘sculture destinate ad essere esposte’. Sedimentare i pensieri, dialogare con altre discipline, nel nostro caso la lettura attenta, quasi da entomologa, del libro di Italo Calvino ‘Le città invisibili’, evidente anche nella citazione di alcuni nomi di città come titoli delle stesse sculture, l’utilizzo di un sottile filo di ferro, di cotone, carta, acrilico, il filo che annoda, blocca i volumi verticali e orizzontali e risolve veri snodi strutturali, il tutto sotto il controllo vigile, e molto professionale, dell’architetto, perché comunque le proprie radici non si possono dimenticare. Ma come scriveva Rogers: ‘la realtà più profonda’, quando dialoga con particolari sensibilità artistiche, come nel caso dei lavori di Isabella Angelantoni Geiger, si trasforma in ‘atti poetici’, e di questo si tratta quando osserviamo le sue sculture nella loro autonomia ‘estetica e semantica’. E’ sufficiente osservare da vicino opere come ‘City#43’, ‘Zenobia’,’Isaura’o ‘Duomo’, per comprendere che, accanto alla dimensione ‘architetturale’, emerge in modo forte e ‘autorevole’, l’aspetto espressivo e simbolico, che trasforma completamente l’eventuale riferimento costruttivo in una composizione che denuncia la propria autonomia linguistica e disciplinare. Il disegno, il modello diventano ‘opera’, riscattando le proprie origini architetturali, non negandole ma sublimandole: una sorta di decontestualizzazione che descrive con grande chiarezza e lucidità Nelson Goodman, nel suo famoso saggio, ‘I linguaggi dell’arte’: ‘anche quando l’oggetto rappresentato è qualcosa di più semplice e più stabile di una persona, raramente la duplicazione coincide con una rappresentazione realistica’. Le sculture di Isabella Angelantoni Geiger non sono piante di città, né verticali né orizzontali, non hanno analogia, se non sul piano della pura e semplice similitudine onirica, con opere esistenti, non possiedono i tratti denotativi che un progetto deve sempre mostrare; sono molto di più in virtù dello scarto inventivo, della qualità della fattura a mano, precisa, attenta e meticolosa. Per esempio non c’è saldatura, ma tutto scorre come se fosse una linea continua e infinita; leggere le strutture ma stabili e sicure, anche se si muovono appena un soffio o un respiro le avvicinano, come fossero esseri viventi. Un’altra particolare qualità di queste opere è costituita dal fatto che si possono appoggiare, ma nello stesso tempo è possibile sospenderle nello spazio e anche svilupparle lungo le pareti, senza con questo perdere la propria identità espressiva, sempre riconoscibile. Flessibilità e unicità; dialogo con lo spazio intorno e, nello stesso tempo, una forte dichiarazione formale autonoma, mantenendo così una specifica materialità che è anche l’espressione identitaria del suo lavoro . Ovviamente ogni ricerca artistica fa riferimento a precedenti esperienze, in questo caso la figura di Fausto Melotti e le sue opere straordinarie, uniche nella tradizione scultorea del secolo scorso, sono sullo sfondo, anche se nel nostro caso, non è il linguaggio musicale a rappresentare un riferimento fondamentale; di nuovo è l’architettura che torna, rarefatta e essenziale, a costituire una sorta di ‘pentagramma’ compositivo. Ancora una volta, ciascuno di noi, e in modo evidente le opere di Isabella Angelantoni Geiger, appartiene alla propria storia; le biografia non sono soltanto le tappe temporali di una vita, ogni biografia è il perimetro nel quale ci muoviamo, più o meno consapevolmente. Le opere di Isabella Angelantoni Geiger ci raccontano la relazione tra architettura e scultura, mostrando con coerenza soluzioni costruttive originali, che superano ogni possibile eredità, per diventare ‘autonome’, nel loro significato più alto e concreto di ‘sculture’.